Actress, author and activist Marlo Thomas has had a wonderful and multifaceted career, and 2010 is already shaping up to be a banner year. She has launched her very own website for women, MarloThomas.com, and like all things Marlo, it is personal, wise and funny; she is also celebrating the release of her sixth book – and only memoir – Growing Up Laughing: My Story and the Story of Funny (Hyperion Books, Sept. 28). And she completed production on a new film, “LOL” (Laughing Out Loud), co-starring Demi Moore and Miley Cyrus, to be released in 2011. The daughter of legendary nightclub and TV star Danny Thomas, Marlo exploded onto the scene with her groundbreaking television show “That Girl,” the first TV program to prove that a single girl could make it on her own in the big city. Conceived and produced by Marlo, the show broke new ground for independent women everywhere. But could she stay on a winning streak after such an auspicious television splash? You bet. Her pioneering spirit continued with her creation of Free to Be … You and Me, her landmark children’s project that became a platinum album, bestselling book, Emmy Award-winning television special and a stage show. She has been honored with four Emmy Awards, the Peabody, a Golden Globe, a Grammy and has been inducted into the Broadcasting Hall of Fame. For her activism, she has received the Helen Caldicott Award for Nuclear Disarmament, the ACLU’s Thomas Paine Award, the American Women in Radio and Television Satellite Award and the William Kunstler Racial Justice Award. Marlo is the National Outreach Director for St. Jude Children’s Research Hospital in Memphis, Tennessee, which was founded by her father, Danny Thomas, in 1962. She is the driving force behind St. Jude’s annual Thanks and Giving campaign which she created with her sister Terre and brother Tony in 2004, a national fund-raising effort that encourages shoppers to “Give thanks for the healthy children in your life and to give to those who are not.” Now in its seventh year, the Thanks and Giving campaign has become an annual national holiday tradition. Her tireless efforts and ingenuity are behind countless awareness campaigns designed to educate the public about the pioneering and life-saving work being done every day at St. Jude – work that impacts the lives of children in communities across America. Marlo lives in New York with her husband Phil Donahue. 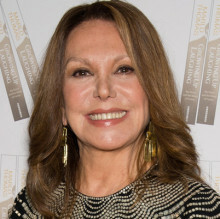 Do you want to hire Marlo Thomas? Directly request a quote. In 48 hours we can send you the availability of Marlo Thomas If you would like to book Marlo Thomas, Entertainment Booking Agency is the right place. We will offer you the best price and contact the management or we directly contact Marlo Thomas. For corporate appearances or speaking engagements you can contact our agents and the will help you true the process. Tags: hire Marlo Thomas, Marlo Thomas booking, book Marlo Thomas, Marlo Thomas appearances, find more information on booking Marlo Thomas for appearances, Marlo Thomas speaking engagements, Marlo Thomas endorsements/spokesperson, Marlo Thomas appearance fees, Marlo Thomas booking agency contact info, biography of Marlo Thomas, Contact an artist booking talent agent find a speakers bureau that can book Marlo Thomas, speaker booking agency for Marlo Thomas, Marlo Thomas booking agency, Marlo Thomas booking for corporate event. EBA is one of the biggest entertainment booking agencies in the World. We book hundreds of celebrities, artist, athletes and speakers in a year. Important to know is that we are not claiming to be the management of Marlo Thomas. We are not the official agent for Marlo Thomas. Companies from around the globe book these artists and speakers true our company be course we have one of the biggest networks and we always have direct contact with the artist or the management. We help you to find the right celebrities for your corporate of private events. Please contact one of our agents to get free advice and we will help to get the world-famous artist on your party.